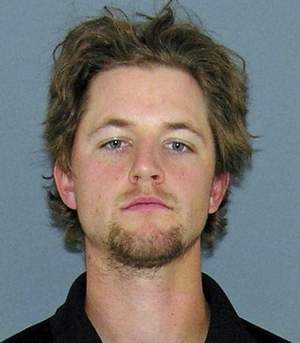 Mug Shot: Cincinnati Reds Mike Leake Arrested for Shoplifting 6 T-Shirts! Dude, What Were You Thinking? Is this crazy or what? Cincinnati Reds starting pitcher Mike Leake was arrested for shoplifting at a downtown Cincinnati Macy’s Monday, accused of trying to steal six American Rag T-shirts with a total value of $59.88. (Simple math: He was accused of stealing shirts priced at $9.98. Really?) The 23-year-old righty starter was booked on a first-degree misdemeanor charge of shoplifting, which carries a maximum of 180 days in jail. According to the police report (here), the incident was captured by store security cameras. His mug shot was released by the Hamilton County Sheriff’s Office. Leake makes $425,000 a year and is only the 21st player to go from the draft to the majors since 1965. In his second season, he is 2-0 in three starts with a 5.40 ERA. This entry was posted in Cincinnati Reds, Law & Order, Strange and tagged Baseball, Cincinnati Reds, Earned run average, Great American Ball Park, Macy's, Major League Baseball, Mike Leake, MLB, mug shot, Starting pitcher, United States. Bookmark the permalink.